For more than 20 years, Takashi kept on using one of his signature icon- flowers, in hope of familiarizing the public with this beloved symbol. 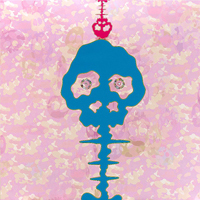 In this series Takashi uses for the first time the skull-like icon in his work, the inception of which derives from the same-named cartoon Takashi watched in childhood. In the aftermath of WWII, for Japanese people the defeat is the signification of not only Japan's loss of cutural identity but also the that of its supreme power. Takashi put two symbols of the war in his work: the nuclear bomb and the mushroom is the representation of death and suffering. The means of presentation Takashi chose to display the Time Bokan series is not unlike that of Andy Warhol's Death in America, only in a way that is much more vibrant and, in a way, cute. The mushroom cloud has a cartoonish complexion and carefully crafted flowers, which signify hope and rebirth, in its sockets. The color of the cloud and the background form a stark contrast against each other. The inception of the Time Bokan series derives from the same titled catoon Takashi had seen as a child. At the end of each episode, the bad guys would always be defeated and then fled in a commotion of an explosion. But then in the following episode they would always show up perfectly in one piece and with renewed strength and scheme.Despite the signification of the skull-like mushroom cloud, what Time Bokan presents is anything but death. It is the image of rebirth after destruction, which also portrayed the spirit of Japanese people after the war- life after death, a world seen through the cartoon world. Takashi Murakami came onto the contemporary-art scene in the 1990s with a Japanese interpretation of Pop art, mixing references to canonical art – historical figures or subjects and consumer sources, blurring the line between art and commercial representations .